(3) If applicant has been awarded an MOS and has 12 months service after release from IADT, the enlistment grade will be the grade currently held up to the grade of SPC (E-5). (2) If applicant was last separated from the active duty Army in the grade of SGT (E-5) with not more than 12 years total active service and enlists within 24 months following separation, or is a current member of the Army National Guard or Army Reserves, the enlistment grade will be SGT, provided the applicant has completed the appropriate NCOES leadership requirements or its equivalent and provided a valid vacancy exists for the primary military occupational series (PMOS) in the grade of SGT. If no vacancy exists in former PMOS, the enlistment grade will be SGT, provided applicant accepts retraining in the MOS provided by the Army Human Resources Command and does not have more than 12 years active Federal service. If enlisting after 24 months from completion of military service, the enlistment grade will be determined by the Army Human Resources Command. (3) If applicant was last separated from any Component or is a current member of the Army Reserves or Army National Guard in the grade of SGT with not more than 12 years AFS, or in the grade of SSG (E-6) with not more than 17 years AFS, or in the grade of SFC (E-7) through SGM (E-9) , regardless of years of service but with fewer than 20 years, the enlistment grade and eligibility will be determined by the Army Human Resources Command. Applicants with more than the numbers of years indicated above are not eligible for enlistment in the active duty Army. 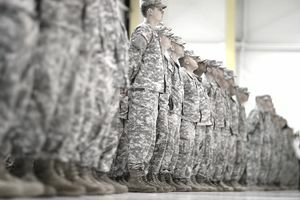 Former members of the Air Force, Navy, Marine Corps, and Coast Guard, including current and former members of their Reserve Components, will have their active duty Army rank determined by the Army Human Resources Command, after an examination of their military records and experience. All prior service, regardless of component, are authorized to enlist at the advanced paygrade for non-prior service, if that is more advantageous. Which Soldiers Are Eligible to Be Army Recruiters? Can You Serve in the Army if You Have a Criminal History? What Does a Special Forces Weapons Sergeant Actually Do?